It's the canary in the ditch, per say, and it tells a scary tale about regulating GMOs. A researcher at Oregon State University examines creeping bentgrass. 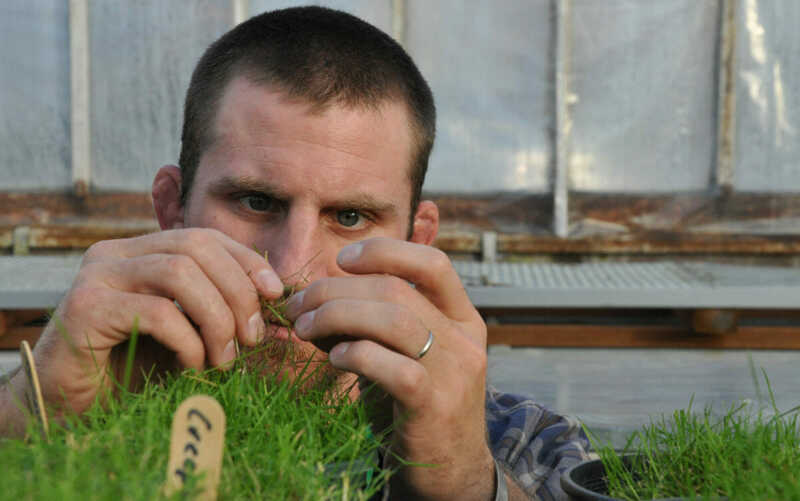 Julia Rosen has a feature over at High Country News about creeping bentgrass, a grass that was genetically modified to resist the Roundup pesticide and designed with golf courses in mind. Creeping bentgrass is not, at least so far, among the most flashily damaging of genetically modified plants, but the way it has been treated by regulatory agencies sheds a light on a myriad of issues with the way the government treats GMO plants. Creeping bentgrass is a variety of green grass which is prized for its ability to, well, creep: it grows strong horizontal stems, which gives it a very even ground cover. That makes it excellent for golf courses and other athletic fields. Uses like such require uniform growth, meaning weeds are always an issue, so Scotts Miracle-Gro, one of the biggest companies in lawn care, developed a strain of creeping bentgrass that is genetically modified to be resistant to Roundup, a popular pesticide sold by the same company. Rosen dives into the history of the approval process of Scotts’ bentgrass, which involved a maximum fine for noncompliance with testing procedures back in 2007. While testing a field of the grass in Oregon in 2013, huge windstorms blew the plant’s seeds miles away. From there, it spread, thriving along waterways and in ditches, where its extreme resistance to the popular pesticide has made it extremely difficult to control. “When lawmakers first confronted GE crops in the 1980s, they decided not to create new laws to regulate them. Instead, agencies used existing laws and split the authority. The Food and Drug Administration would oversee edible crops and the Environmental Protection Agency would manage pesticides and plants engineered to produce biopesticides. The USDA already had the power to guard against plant pests, a category that includes parasites, microbes, bugs and other critters that physically harm plants or plant products. And because most GE organisms were initially modified using DNA from bacteria or viruses – both pests – they came under the purview of APHIS’ Biotechnology Regulatory Services. The regulations lag perilously far behind the scientific updates; new tools like gene guns are completely unregulated, leaving companies free to test and plant crops with no oversight. Creeping bentgrass is not necessarily the problem – it’s a problem, but it’s more of a warning sign of what can slip through the cracks given the current regulatory state. Check out the entire story, it’s worth the read.